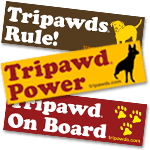 The recent addition of Garden Stone Pet Memorials to the Tripawds Remembrance page got us thinking about other ways to make everlasting memories with your three legged friends. Create a custom garden stepping stone or memorial marker with this reusable Paw Print Stepping Stone Kit from Milestones. This fun project is ideal for kids to help them cope with the loss of your dog’s leg. 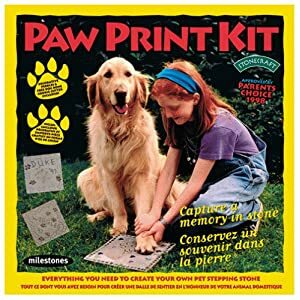 Approved by Parent’s Choice 1998, the kit contains a 3.5-pound starter bag of dry cement, mixing and writing tools, river pebbles, a reusable 8-inch vinyl mold, and even a doggie-bone cookie cutter. Mixing requires a bucket, water, and adult supervision. Once blended, the mix pours into the vinyl mold, ready for paw printing and decorating with your favorite pet memorabilia. After about 30 minutes, you can write on it as well. If you plan to give the finished product as a gift, be sure to build in the minimum two-day drying period or a full week if the stone will be unveiled outdoors. plus a free dog bone cookie cutter! 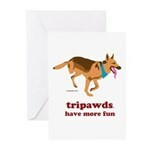 Consider these other fun stepping stone project kits to immortalize your beloved pets. See all stepping stone kits from Milestones. This retro look flower-shaped stepping stone kit is a real winner. Real stained glass mosaic pieces make this kit a perfect gift for the person who loves lots of color in the garden. 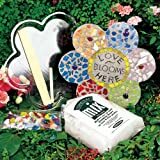 Kit contains 7 pounds of stepping stone mix, 12″ plastic flower mold, real stained glass mosaic pieces and glass gems, wooden mixing paddle, writing tool, and easy-to-follow instructions. This leaf shaped stepping stone kit is packed with recycled, earth-toned stained glass and letter stamps. You’ll have everything you need to make a unique decoration for your lawn or garden. 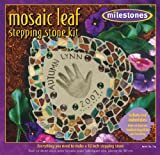 Kit includes plastic reusable stepping stone mold, seven pounds of stepping stone mix, recycled stained glass pieces, letter stamps, mixing and writing tools and easy to follow instructions. A personalized stepping stone provides a beautiful, lasting way to spruce up any garden or walkway. 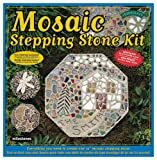 This Mosaic Stepping Stone Kit from Milestones contains a 7-pound bag of dry cement, mixing and writing tools, plenty of stained-glass mosaic pieces, a reusable 12-inch vinyl mold, design ideas, and thorough instructions for completing your project. What a great way to make an impression! 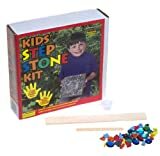 This Kids’ Step Stone Kit includes everything you need to make a wonderful stepping stone: StoneCraft mix (containing Portland Cement and silica sand), rainbow rocks, glass gems and glitter, and a craft stick for writing. 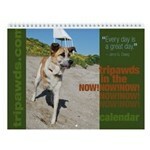 Kids will love making pictures of gardens and rainbows, or immortalize their pet’s paw prints.